Investors are buzzing about Alibaba's long awaited U.S. initial public offering, but the real market mover Wednesday is expected to be testimony from Janet Yellen on Capitol Hill. Chinese tech behemoth Alibaba filed paperwork on Tuesday that sets the stage for what could be the biggest initial public offering in U.S. history. Yahoo (YHOO) owns a 24% stake in Alibaba and will profit nicely after the IPO is complete. Shares in the U.S. tech company jumped by 2% ahead of the opening bell. Aside from Yahoo, U.S. stock futures were slightly higher Wednesday, pulling out of their earlier slump. Investors will pay close attention to the Federal Reserve chair when she heads to Capitol Hill at 10 a.m. ET to answer questions about the health of America's economy. Yellen's script is likely to mirror the Fed's statement last week when it decided to dial back its bond-buying program by an additional $10 billion. But she has surprised markets before. "The market is positioning itself for (more) dovish comments [from Yellen]. That means that we would get a bigger reaction in both bond and [currency] markets to relatively hawkish comments, but it is hard to imagine those happening," said Societe Generale strategist Kit Juckes. Marc Chandler, strategist for Brown Brothers Harriman, said, "Her comments today are not expected to deviate much in substance from the FOMC's statement last month." In corporate news, AOL (AOL) reported a jump in quarterly revenue, driven by advertising. But shares slipped in premarket trading as net income took a dive. Brewer Molson Coors (TAP) reported that "underlying after-tax income" more than doubled during the quarter, compared to one year ago, but net sales slipped and worldwide beer volume was flat. Tesla (TSLA) and SolarCity (SCTY) will report after the close. Shares in Anheuser-Busch InBev (BUD) were edging higher, recovering from lackluster trading after the brewer reported lower than expected profits. Whole Foods (WFM) shares were plunging by 17% in premarket trading. The company posted earnings that fell short of expectations and issued a disappointing outlook on Tuesday. Shares in Groupon (GRPN) dropped significantly before the bell after the firm reported a larger-than-expected quarterly loss. U.S. stocks closed in the red Tuesday. The Dow Jones industrial average lost nearly 130 points and the Nasdaq fell 1.4%. The S&P 500 fell 0.9% after advancing on each previous Tuesday this year. 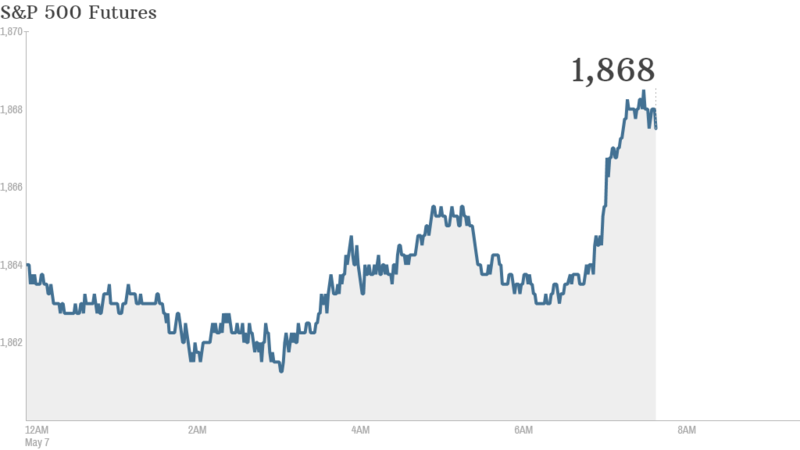 European markets were mostly moving up in morning trading. Asian markets all closed with losses. The Nikkei in Japan sank by nearly 3%.